You heard it right. Mandopop group 5566 are reuniting yet again and will be making its way to Singapore very soon. At the height of its fame, the band had amassed a huge global following with a string of catchy hits over its four studio albums – the latest was 2008's Bravo. The band disbanded the same year but reunited briefly in 2014 and 2016. However, Rio Peng had definitively left the band. This time round, the band will perform here sans Sam Wang due to conflicting schedules. The remaining three members, Tony Sun, Jason Hsu and Zax Wang will be sure to put on an unforgettable night of nostalgia. 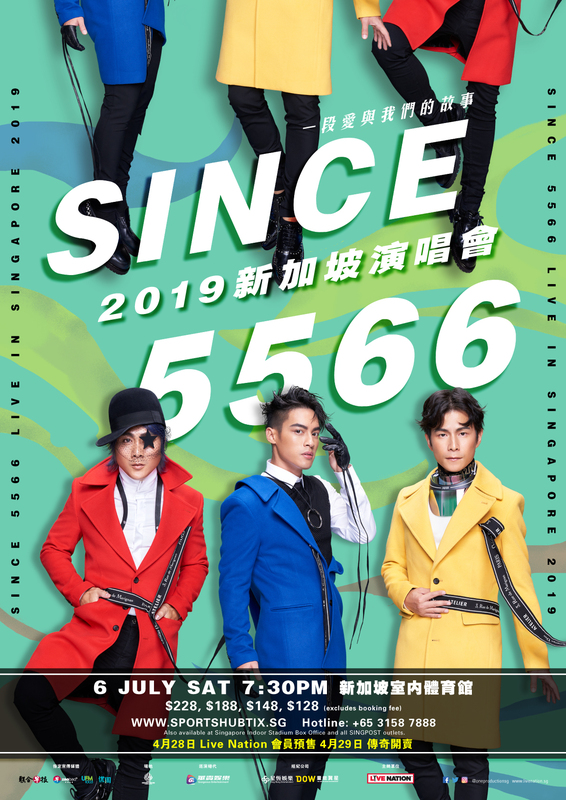 SINCE 5566 Live In Singapore 2019 will be happening on Saturday, 6 July, at the Singapore Indoor Stadium. Live Nation members' pre-sale starts on Sunday, 28 April, 12pm to 11.59pm. General sales starts on Monday, 29 April onwards.Tickets, $128, $148, $188, $228, are available here. Watch the music video for 'I'm Sad' below.